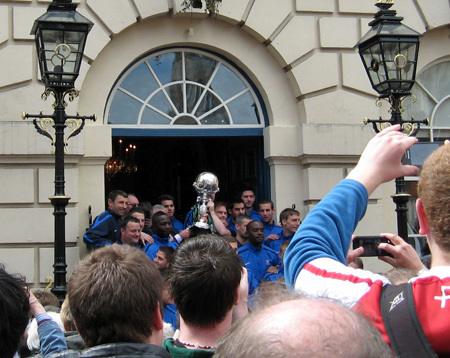 Let’s begin with this photo of our football team standing on the steps of York’s Mansion House, on Tuesday, with the FA Trophy, won last Saturday at Wembley. Hurrah. It’s been an important week in the history of the football club. Not just the FA Trophy win, and another trip to Wembley on 20 May for the play-off final. The approval of the planning application to build a new stadium out at Monks Cross came on Thursday, after a long-winded process, much controversy, and a very long meeting to decide the issue. The stadium will house not only the football club, but York City Knights rugby club. Stadiums don’t come cheap, of course, and so the development also includes an ‘enabling’ retail ‘offer’ – including a massive John Lewis store and a massive M&S store – all to be built out at the Monks Cross retail park near the ring road. I’m not a fan of shopping in characterless places like Monks Cross, or indeed of shopping in general. I’m not a sports fan either. Therefore, basically, neutral. I’d prefer things to stay as they are. But it seems they can’t. So, a few thoughts on the recent decision, and the campaigning of the last six months or so, which I’ve been following with interest. Back in November I went to a meeting held by the ‘Campaign for York’ group. Perhaps, as I have a website called York Stories, and have been going on about York for years via its pages, you’d expect me to go as a supporter of this campaign to ‘protect York city centre’. But I didn’t. The campaign leaflet made me angry. I went to the meeting to hear the arguments, not as a supporter. It’s a long while since I’ve been to a campaign group meeting. This one wasn’t like any I’d been to before. Normally, in my experience, they’re in small rooms – community centres, church halls etc. This was in the Tempest Anderson Hall alongside the Yorkshire Museum – and with its access through that rather grand frontage. My immediate and abiding impression was that this was the ‘York Establishment’ speaking. I don’t know the kind of people who could hire Tempest Anderson Hall at short notice, or indeed with a lot of notice. At that point, the pro-stadium camp seemed the underdog. Like many people, I was alienated by the name of the ‘anti’ group. It’s always dangerous to claim to be speaking for everyone. I didn’t feel they were speaking for me, or on behalf of ‘York’. Sadly, from that meeting and continuing, it looked mainly like a 21st century version of the trade guilds of old – the same kind of protectionist basis. It looked only as if they wanted to safeguard their own interests and were fearful of ‘incomers’ taking their trade and upsetting the balance. Understandable, of course, but not particularly inspiring for many of us York residents, and not representative of the wider York I know. The wider York I know extends well beyond the city walls and includes people who have little stake in the increasingly gentrified city centre – particularly that historic core so much changed, so clearly for tourists. The Campaign for York’s assertion that the city centre would ‘die’ because of the proposed developments out at Monks Cross appeared, and still appears, rather baffling. I wondered, were they looking properly at the thing they were so assiduously defending? Was their city centre the same one I was seeing? Comparisons were made to other cities that had suffered after large shopping centres were built on their outskirts. The comparisons were to places like Sheffield and Castleford. Don’t want to be rude, but – well, you know. I was offended on historic York’s behalf that a couple of big glitzy palaces to consumerism stuck out near the ring road were seen to be somehow about to pull the life out of our centuries-old multi-layered beautiful history-soaked city. The tedious propaganda wasn’t all on one side, of course. I was somewhat surprised that there wasn’t a massive public outcry/outburst of laughter at the leaflet distributed by Oakgate and partners, in support of the stadium development. It proclaimed: ‘John Lewis coming to York – CAN IT BE TRUE? – IT’S UP TO YOU!’ When I looked out of the window my neighbours weren’t dancing in the streets, but clearly should have been. I got a kind of dull ache in my soul. Point 1 – it’s a shop. It’s not the Second Coming. Point 2 – it wasn’t up to ‘you’/us at all. It was probably already a done deal, as so much work had been invested already in the scheme, and in any case, it’s decided according to planning guidelines (though these are, it seems, bent to fit in the most surprising fashion when required), not because Mrs Smith from Acomb sent in a tear-off slip. Basically, it’s been a depressing thing to observe. There’s been much scaremongering on both sides. It seems to me that the only sane voices have been from the Green Party, and those who are broadly sympathetic to them, and from some members of the general public who have commented on the York Press website. These voices were usually lost in the middle of an increasingly vociferous debate mainly consisting of a few people expressing the same entrenched opposing views. On balance, it seems that approving the plans was inevitable and necessary. That doesn’t mean it’s good, in the longer term. Putting this massive development out at Monks Cross seems a bit short-sighted, and in a few decades we might want to move the stadium back into the city centre. I don’t know if the concerns regarding yet more traffic on an already congested ring road have been addressed. York has always been a bit behind the times, slow and cautious. This is a good thing, sometimes, and I guess that’s why we never got that hideous new inner ring road proposed in the 1970s. We seem to wait to see what other cities do. Other cities have put sports stadiums outside town, so now we’re going to. Though, if we were really cool and modern and inspiring and brave we would have found a way to locate it at York Central. Instead sports fans have been offered a rather uninspiring construct in the middle of an equally uninspiring retail park. It must not be forgotten, of course, that the football club nearly lost its Bootham Crescent ground ten years ago, and that they’re still there only because an agreement was eventually reached to allow them to stay there until 2014. Developers are waiting in the wings, eager to cover the Bootham Crescent ground with housing. I’m not a football fan, but my partner is a York City fan. We live close to Bootham Crescent. I know what our football club has endured in the last ten years or so. The least impressive human traits, circa 2001, demonstrated by a few individuals, followed by massive solidarity demonstrated by thousands. Some of those opposed to the stadium development see it as an unfair ‘bailing out’ of a business in difficulties. A rather bizarre stance. The football club isn’t just another business. It represents the city, and must mean something to a lot of people, judging by the coachloads of people following it to Wembley. Many York residents support the club in a less proactive fashion, wishing it well in the play-offs and other important games, and enjoying the reflected glory of any impressive results. And perhaps, like me, many of us had a period of being a fan, in the past. I was at Old Trafford when plucky little York won 3-0 against Manchester United, and will also never forget standing on the Bootham Crescent terracing with Eric Cantona on the pitch only a matter of metres away, with York fans singing rude songs at him. And the thousands of people heading down Bootham, and the massive Manchester United team coach turning into Bootham Crescent. I don’t recall any other York-based ‘business’ providing such excitement and so many memorable moments. So, if it is the case, as we were assured it is, that the club could not survive unless it was given a new home, then the approval of the planning application is a good thing. Because I can’t imagine a city like York without a football team. There are only a few things which provoke pride in one’s town or city. It changes always, of course. I used to feel pride when a train I was on said ‘BREL YORK’ on the carriages. We could also be proud that we manufactured famous chocolate and confectionery. We’ve lost a lot of those things that meant ‘York’ to the vast majority of us who live and work beyond the somewhat gentrified walled city. So if we have to accept a less than ideal plan, funded by rich developers, which means we still have a football team, then so be it. And for the record, I doubt I’ll ever shop at John Lewis or the big new M&S. I’ll carry on visiting the city centre shops, maybe occasionally visiting the Designer Outlet – that other massive retail development which could have ‘killed’ the city centre, but didn’t. But I’ll spend most of today listening to BBC Radio York, hoping for the right result at Wembley, where many of my nearest and dearest will be watching our team try to get back into the football league. WELL DONE YORK CITY! BACK IN THE LEAGUE! Well done ‘’Plucky little York’’,many of us ex Yorkies are as delighted by their two successful Wembley games,as we are by any other ‘football -European/International,or Olympic’ events,in the wider sporting calender. Him in the house must be delighted!! Hi Stephen, great isn’t it? – so pleased for all the fans who have supported the club for years, they’ve had to endure a lot of misfortune in recent years. Everyone has worked so hard, and the victory is certainly deserved. Extremely thoughtful article on the Monks Cross/community stadium controversy – easily one of the most considered I have seen on this issue and a far cry from the bombast that has all too often characterised the debate. Congarulations on the website too – I have just come across it but will most asssuredly keep coming back! Thanks Patrick. I am of course in the fortunate position of not having had to comment on behalf of any ’side’ in the debate, but have had the luxury (if that’s the right word) of having all these months to read the opposing views. Anyone have an objective overview on the ‘Planning vision withdrawn’ story? As a visitor to York, I found the place having visited twice, lively, vibrant and the city centre much much better than Canterbury City Centre the nearest to me for retail shopping. I don’t think York needs to worry about dying retail wise. I’m not really keen on your designer shopping outlet as I found the McArthur Glen Outlet in Ashford Kent was better and the bargains better value. For clothes shops and most shops I think you beat Canterbury hands down. For museums and simply for your churches and claim to fame as the C of E heartland, I think it should be given to York versus Canterbury. But Department store wise, I found your Fenwicks small as was Debenhams. If there is one let down in York City Centre it’s the lack of a reasonably large department store and I can’t help think that the Copperfield Centre could be more sympathetically redeveloped to blend in with the surrounding architecture and at the same time provide York with a large city centre department store. I did visit Monk’s Cross shopping centre where JL are going and think they are making a big mistake to go there. But I don’t think JL not coming to the city centre will be the end for York City Centre. The only other thing I felt you lacked as a city the diversity that Canterbury has was on restaurant’s. Though Betty’s is a great little tea shop. Thanks Gabriella for your perspective on this. Interesting that you mentioned the department stores (lack of) as I think many people feel the same, and want John Lewis to come to the Coppergate/Piccadilly area, but we don’t really have a site big enough. The plan is to redevelop the Castle/Piccadilly area, but it’s a complex one and will take years to achieve. Well, the Council’s own retail consultants said this would result in a loss to city centre businesses of £50,000,000 per annum. Independent retail consultants put that figure much higher. This will put people out of business and dissuade others from settling in the centre of York. In order to mask the damage they have done, the restrictions on ‘what can go where’ have been relaxed and even ‘Primary’ shopping streets like Coney Street now have voids (empty units) and charity shops and chain-restaurants like “Bill’s” appearing. It’s a sad state of affairs, even if we are bouyant compared to Castleford and Wakefield (similarly crippled by out-of-town White Rose Retail Park). I can’t blame football fanatics (after all… they are fanatics) but I place the blame firmly on the Labour and Lib Dem Councillors who backed out-of-town retail development… against all national, regional, and local planning guidence. The Piccadilly site was bigger than John Lewis’ store at Monk’s Cross, so JLP speaks with forked tongue, as it did to the Government’s Select Committee, saying it adhered to the principle of “city-centre-first” retail. JLP is literally unprincipled.